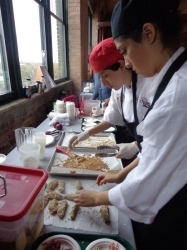 Aspiring young chefs will serve up some delectable and nutritional meals Thursday as they face off in this year’s tenth annual Cooking up Change, a culinary competition founded by Healthy Schools Campaign. 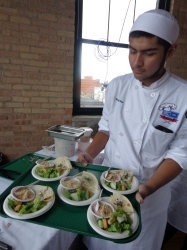 The competition challenges CPS students to create healthy meals adhering to strict nutritional standards and a budget. This year, the competition will take place at Skyloft at the Bridgeport Art Center, 1200 W. 35th St., Chicago on November 17th beginning at 1p.m. Lawndale Bilingual Newspaper interviewed Vice President of External Affairs at Healthy Schools Campaign Sara Porter to talk about this year’s competition and the importance of healthy eating. Lawndale Bilingual News: This year marks the tenth anniversary of Cooking up Change, which began in Chicago and now reaches more than 30 cities across the country. What can you tell me about the growth of the program in the last ten years and how it has transformed the lives of students? Sara Porter: Cooking up Change started as a healthy cooking competition in Chicago and now includes cities from across the country. Over the past 10 years, more than 1,800 student chefs have participated and more than 8.2 million student-designed meals have been served in school cafeterias across the country. 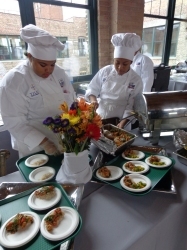 In Chicago alone, more than 750 student chefs from 21 schools have participated and earned $192,000 in scholarships to Washburne Culinary Institute. Cooking up Change puts student voices front and center in the conversation about school food, in their city and their country. Many students have gone on to pursue careers in the culinary field. Cooking up Change is part of the Healthy Schools Campaign that challenges students to prepare meals that are nutritional and within a budget. Explain to me the importance of both aspects of the program? Cooking up Change challenges high school culinary students to create a healthy school meal that they are excited to eat, but that can also be served in their school’s cafeteria, so adhering to the nutritional requirements and budget are key. We want to make sure that the meals the students are creating can be replicated in school kitchens across the country. The winning meals are often added to the menu rotation in local school districts. In Chicago, more than 3.6 million student-designed meals have been served. What do you enjoy most about Cooking up Change? It is incredibly inspiring to see the students present their meals to the judges and guests. They work really hard to create these delicious menus and then get to share them with so many people. It’s exciting to follow the journey of the winning team as they first see their meal served across the district and then travel to Washington, D.C. to present their meal to the national judging panel and members of Congress. How do you think this program is shaping the lives of youth across the country? Not only does the program allow students to use their culinary skills to change the future of school food, it shows them that their opinions and their voices matter. Cooking up Change helps students develop leadership, teamwork and communication skills, all which serve them well beyond the kitchen and the classroom. Students are given the opportunity to engage with leaders in their cities and national leaders and tell them why ensuring students have healthy food–that they’re excited to eat–is so important. What can you tell me about this year’s group of CPS students who are involved in Cooking up Change? We have students from 11 different high schools competing this year. They’ve designed some really creative menus and are all excited to be a part of the 10th anniversary of Cooking up Change. The teams will be competing for scholarships to Washburne Culinary Institute and a trip to Washington, D.C. to compete in the national finals. If a school is interested in incorporating Cooking Up Change into their curriculum, where can they go for more information? Schools or districts interested in getting involved can visit cookingupchange.org or contact me at sara@healthyschoolscampaign.org.